Camp Tamaracouta is the oldest continually operating Scout Camp in the world, since 1912. It occupies a 1000 acre site 72 Km north of Montreal in rolling wooded country. St.Sauveur's ski slopes are just 7 km NE by crow. Campsites are named after Hudson's Bay Company fur trading posts in Canada's northwest. Continuing the theme, the camp director is called a Factor. There is also a Ranger. Knights of Tamara were veteran scouts who qualified by deed and ordeal to wear a beaded thong at the wrist. Log cabins, Lodges, Jubilee Hall, Tamaracks, and A-frame, all denote livable cabins of various kinds. Cabooses are real, 6 of 'em, on tracks and fitted up for use even in winter. Old-timers will remember the original gate at the west end of camp. It's still there. The current entrance is the long house containing office, canteen, and a lounge full of ancient scout memorabilia. BP's footprint from a long-ago visit is out front. 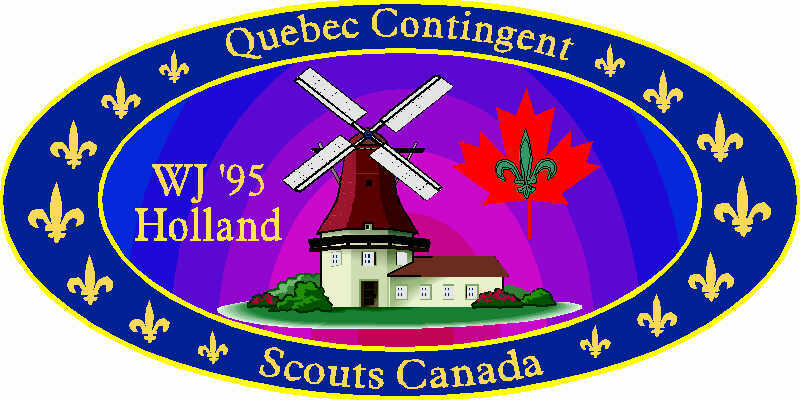 The map was commissioned by Brenda Bleakley, Director of Camping Services for Scouts Canada's Quebec Provincial Council. Sources were: existing maps including one by Eric Turcotte, one I call the Ft McLeod map for its mention of this ghost site; a Quebec map 31G16-100-0203; and aerial photos Q83806-48, and -49. The shield was lifted from a Knights of Tamara letterhead, Scouts Canada logo is on Compuserve, and the butterfly is, of course, BP's.